While every mobile phone brand in the world is obsessed with putting more and more power in their handsets, Cherry Mobile is hooked up in coming up with brighter and more unique ideas. Smartphones may be the “In” thing and there’s no denying the fact that they are much more efficient. 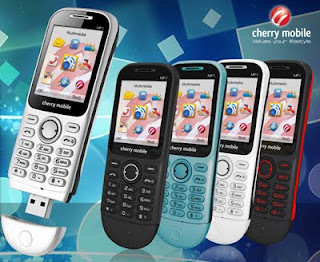 However, not everyone feels the need for these sophisticated gadgets so if you prefer the good old candybar phone with Wi-Fi capability, 3G network support, and at the same time affordability, then Cherry Mobile MF1 is the best for you. And did we mention it comes with a built-in 3G USB Dongle, too? Unbelievable? No, it’s not. Besides the typical multimedia player, Bluetooth function, and FM tuner, this handset can be used as a 3G USB Dongle or a portable Wi-Fi hotspot. So, rather than buying a separate 3G USB modem or a Pocket Wi-Fi, the MF1 is a better alternative. The Cherry Mobile MF1 is available at all Cherry Mobile concept stores, kiosks, and accredited dealers nationwide for only Php1,999. Available in 4 color schemes.